Description About The Author:- Bharat Jhunjhunwala was born in a family having interest in sugar, paper and electronic industries. He acquired his doctoral degree in Food and Resource Economics from University of Florida at the age of 23. He joined Indian Institute of Management, Banagalore as an Assistant Professor.Contents:- Preface , List of Contributors , Introduction : Lessons from Dam Removals in the United States/Bharat Jhunjhunwala Part I : WHY DAMS ARE BEING REMOVED IN AMERICA : , 1. Problems of Dam Removal/Jock Conyngham, J. Craig Fischenich and Kathleen D. White , 2. Funding Sources for Dam Removal/Betsy Otto Part II : EXAMPLES OF DAM REMOVALS IN AMERICA : , 3. Economic Analysis of Removing Four Dams on the Lower Snake River/Taxpayers for Common Sense and others , 4. Non-use Values lead to the Removal of Elwha Dam/Baltelle , 5. Removal of Edwards Dam/Michael Paulson , 6. Removal of Embrey Dam/HalWiggins , 7. Denial for Wilkes-Barre Inflatable Structure/U.S. Army Corps of Engineers , 8. The Motts Run Water Treatment Plant/Spotsyluania County Part III : COST-BENEFIT ANALYSIS OF HYDROPOWER DAMS : , 9. Cost-Benefit Analysis/Office of Management and Budget, Government of United States , 10. Economic Value of Hydropower/David Marcus , 11. Critique of FERC's Approval to Klamath Hydroelectric Dam/Jon H. Goldstein Part IV : ENVIRONMENTAL IMPACTS OF HYDROPOWER DAMS : , 12. Impacts of Hydro Dams on Environment/Roger Young, Graeme Smart and Jon Hording , 13. Impact of Hydro Turbines on Water Quality/United States Court of Appeals , 14. River Continuum Concept/Wikipedia , 15. The Wild and Scenic Act/Pamela Baldwin , 16. The Wild and Scenic Act in Operation/Interagency Wild and Scenic Rivers Coordinating Council Part V : ECONOMIC VALUE OF FREE-FLOW OF RIVERS : , 17. Non-use Value of Free Flowing Rivers/John Loomis , 18. Economic Value of Rivers/New Jersey Department of Environmental Protection , 19. Economic Value of River Banks/Ann L. Riley.About The Book:- Hydropower Dams Are Being Removed In America While They Are Being Built In India. Our Experts Calculate That Immense Benefits Can Be Reaped From Hydropower While American Calculations Show That Hydropower Is Costly If Economic Costs Of Loss Of Fishing, Recreation, Biodiversity, Etc. Are Taken Into Account. The Use Of Rivers For These Alternate Activities Generates Welfare Directly By Improving The Quality Of Life. It Also Generates Large Incomes From These Alternate Activities. They Are Removing Dams Because They Reckon Benefits From Free Flows Of Rivers To Be Larger Than From Generation Of Hydropower. This Book Draws Lesson From The American Experience. It Shows That Proper Economic Analysis Of Dams Being Made In India Will Show That They Perpetrate Economic Harm On The Country. This Book Is Essential Reading For Economists, Power Sector Officials, Power Generation Companies And Environmentalists Alike., About The Author:- Bharat Jhunjhunwala Was Born In A Family Having Interest In Sugar, Paper And Electronic Industries. He Acquired His Doctoral Degree In Food And Resource Economics From University Of Florida At The Age Of 23. 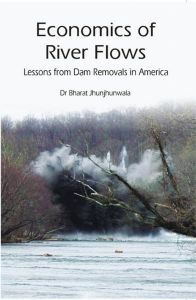 He Joined Indian Institute Of Management, Banagalore As An Assistant Professor., Content:- Preface , List Of Contributors , Introduction : Lessons From Dam Removals In The United States/Bharat Jhunjhunwala ,Part I : Why Dams Are Being Removed In America : , 1. Problems Of Dam Removal/Jock Conyngham, J. Craig Fischenich And Kathleen D. White , 2. Funding Sources For Dam Removal/Betsy Otto ,Part Ii : Examples Of Dam Removals In America : , 3. Economic Analysis Of Removing Four Dams On The Lower Snake River/Taxpayers For Common Sense And Others , 4. Non-Use Values Lead To The Removal Of Elwha Dam/Baltelle , 5. Removal Of Edwards Dam/Michael Paulson , 6. Removal Of Embrey Dam/Halwiggins , 7. Denial For Wilkes-Barre Inflatable Structure/U.S. Army Corps Of Engineers , 8. The Motts Run Water Treatment Plant/Spotsyluania County ,Part Iii : Cost-Benefit Analysis Of Hydropower Dams : , 9. Cost-Benefit Analysis/Office Of Management And Budget, Government Of United States , 10. Economic Value Of Hydropower/David Marcus , 11. Critique Of Ferc's Approval To Klamath Hydroelectric Dam/Jon H. Goldstein ,Part Iv : Environmental Impacts Of Hydropower Dams : , 12. Impacts Of Hydro Dams On Environment/Roger Young, Graeme Smart And Jon Hording , 13. Impact Of Hydro Turbines On Water Quality/United States Court Of Appeals , 14. River Continuum Concept/Wikipedia , 15. The Wild And Scenic Act/Pamela Baldwin , 16. The Wild And Scenic Act In Operation/Interagency Wild And Scenic Rivers Coordinating Council ,Part V : Economic Value Of Free-Flow Of Rivers : , 17. Non-Use Value Of Free Flowing Rivers/John Loomis , 18. Economic Value Of Rivers/New Jersey Department Of Environmental Protection , 19. Economic Value Of River Banks/Ann L. Riley.